Barchemicals Group represents a completely Made in Italy reality formed by 3 operating companies which share visions, values, and projects. Founded and directed by dr. Corrado Barani, it operates from 35 years in Water Treatment Sector: primary water, drinkable, and pool water – in Italy and abroad – dealing with technical aspects, planning, and management, with particular care for disinfecting, environmental sanitizing, water treatment, control systems, dosage, and automation. The Group is the owner of numerous patents; resources dedicated to Research and Innovation make up the majority of the investments. The group is present on the market thanks to the diversity of companies that define it, each one offering the clients of the Barchemicals Group a complete and specialized service. Barchemicals is the parent company; produces chemical products for the treatment and conditioning of all types of water. The thirty-five-year experience is summarized in 4 product lines; Pool, Detergent, RT line (Process Water sector) and “I Sali della Vita®” (Salts of the Life) Line. Thanks to an innovative productive and efficient system, it internally designs and produces chemical specialities of elevated and trustworthy quality. All the products, rigorously “Made in Italy”, comply with severe criteria of quality and are developed through a rigid execution of research and safety tests. Engineering Corporation is specialized in the design and production of systems for water depuration, electronic control units and control-dosage systems for swimming pools and water treatment plants. Reliability, safety, and innovation are the fundamental values of our Made in Italy Technology. Barchemicals Biopharma was born to guarantee health safety by offering specific services in the diagnostic and preventive field of the treatment and disinfecting of water. Endorsing decades of chemical pharmaceutical competence, it has operated in the department of research and development of products, systems and methods guaranteeing the balance and bio-safety of drinkable water, domestic and recreational water. Barchemicals Group, through the brand Alpha Aqua, it has been active in the commercialization of products and technology for construction, management and maintenance of pools, aquatic parks, wellness centers and Spas. Barchemicals directly produces a wide range of chemical products for pools and wellness centers: chlorine and oxidants, chlorine derivatives, blast chlorine, pH correctors, algaecides, bactericides, flocculants, special products, disinfectants and sanitizers for hard surfaces, detergents, degreasers and descalers, products for thermo-hydraulic and industrial circuits. The new “Eco Green” and “Titanium Line” product lines guarantees high quality and low environmental impact, and a significant energy and water conservation. DDS 3000 hypochlorite calcium for pools of large dimensions (aqua parks, public pools, multi-pool installations). Smart Telepool Save Energy is the flagship model of the Telepool Line: it assures top water quality by matching modular control of water recycle systems with considerable energy conservation and it’s equipped with a user-friendly touchscreen LCD display. Smart Telepool Save Energy is easily programmable: customized “warnings” can be introduced according to limits and values set by the law; it can measure and store data; it manages text messages about alarms and the alarm modes can be set by remote. Available in Italian, English, French, Spanish and Russian, Smart Telepool Save Energy is at the cutting-edge of the technology for colorimetric monitoring systems even during break point treatments: free chlorine, combined chlorine, total chlorine pH, redox, conductivity, temperature (°C) control and manage the dosing systems connected to keep the values of chlorine and pH constant. Proportional dosage and ON/OFF; access data log; three password levels. I Sali della Vita - Salts of the Life - is the new water treatment line that, through the Biostabilization process, it reconstructs the characteristics of the best alkaline magnesium thermal waters, allowing one to benefit directly in the pool or Spa all the advantages present in healthy mineral salts: Magnesium (Mg), Potassium (K), Iodine (I). Also available in EASY POOL KIT version, the new system of disinfection and maintenance of water of private pools without chlorine, and easy to use, the product is packaged in convenient single-dose packets with colour codes. 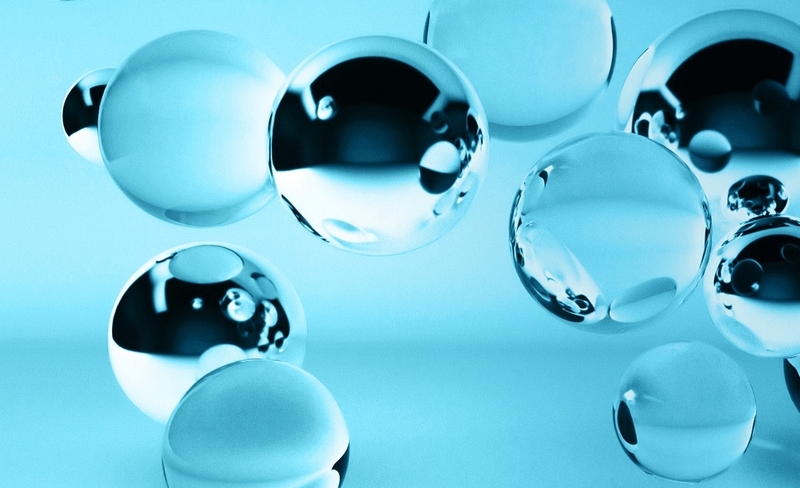 BioVitrum® Spheres is the new filtration medium of the BioVitrum® Line for Water Filtration, consisting of potassium sodium silicate glass microspheres. BioVitrum Spheres provides maximum efficiency during backwash by reducing water and electricity consumption by more than 50% due to the particular shape of pearls and their chemical characteristics, that allow the filtration of any type of water. Furthermore, the pearls prevent the formation of limestone and silica incrustations by avoiding the “packing” of the filtration mass and creating preferential escape routes. The high sphericality of BioVitrum Spheres also reduces the water flow between the spheres, making filtration effective even at high speeds. Also available in the BioVitrum Spheres Ag + version, In this variant, the surface of the spheres is coated with cationic and metallic silver, thus reducing up to 99% of the biofilm formation.